Allou! 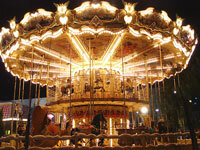 Fun Park has rides to suit every age group and thrill threshold. Visitors soon realise why it's the city's most popular theme park. Access is technically free, meaning anyone can enter and soak up the festive atmosphere. Otherwise, all rides and activities accept a variety of payment options. Visitors planning to spend a few hours enjoying themselves should purchase an Allou! Day Pass. It allows limitless access to almost all of the rides and games on offer. Admission: Daily pass for all games is €16. Concessions available.